Mile: 4:20.3 1959; Marathon: 2:25:45 1965. 1st SAAA marathon 1966, 3rd SAAA Marathon 1964 and ’65. Charlie started out as a track runner running well over 880y and the Mile, going round the Highland Games, Sports Meetings, etc, and running in championships, before moving up a distance or three and finding his athletic niche as a marathon runner. In the unofficial 1946 Scottish XC championship, Shettleston won the team title, with four runners in the top ten. Consequently, McAllister ran for Scotland in the International XC Championships on Ayr Racecourse. 1960 1M 4.14.4; 1960 2M 9.16.0; 1962 3M 14.34.0. Ronald was 19th and third counter in the ESH team which won bronze medals in the 1957 Senior National XC championships. He ran the E to G four times, gaining team silver medals in 1961 and 1962 (when he ran the fastest time on Stage 8). Alistair was in Bellahouston teams that: won the 1985 Scottish 6 Stage Road Relay; and secured silver medals in the 1983 E to G and the 1984 Scottish XC Relay (plus bronze in 1985). Pat was a a member of Paisley Harriers who represented them in all the cross-country championships and in the Edinburgh to Glasgow relay in winter. He was also a good road runner who ran all over the country as a member of the Scottish Marathon Club, travelling in Jimmy Scott’s van to Dundee, Strathallan, etc as well as in local road races such as the Dirrans 13 pictured above. In the 1963 season-long SMC championship, he finished third; and later became Captain and then an important committee member. Charlie was fifth in two National Marathon championships: the Scottish in 1971; and the Australian in 1973. Before he emigrated, he was known as a hard-training, tough, cheerful guy who loved demanding cross-country courses. He ran XC for Scottish Universities and featured in several AU team successes in North of Scotland road races (as well as third place in the 1971 Welsh classic Nos Galan). In the E to G, AU’s best ever position was a respectable 9th in 1970. In 1980, Duncan was part of the Cambuslang team that won bronze medals in the Senior National XC championships. He ran the E to G in 1979, when they finished fifth. 1969 6M 31.36.0; 1975 Mar 2.39.13. Started running when doing National Service between 1956 and 1958 and started running for Clydesdale Harriers on demob in October 1958. Ran in all the usual races (including 20 consecutive E-G’s. Other pb’s include Mile in 4:24, Three Miles in 14:45 and 16+ miles Clydebank to Helensburgh 1:28 (Best C-H result was fourth in 1969). Described by Allan Faulds as a good, reliable club runner’. Paul was a member of Lochaber AC where his father Eugene had been a long-time member and hill runner. Paul joined Cambuslang Harriers and was in teams that won gold medals in the 1987 Junior National Cross-Country; and the 1987 Edinburgh to Glasgow relay. Alan was a very promising young runner, coached by John Radigan, who had an excellent group including Graeme Croll,and after John left to the area for business reasons, Alan went to Alex Naylor but didn’t stay in the sport for much longer. 1961 Mar 2.37.32; 1981 Mar 2.39.20; 1982 Mar 2.33.19. Bill was an irrepressible, tough, genial man who won a silver medal in the 1961 Scottish Marathon championship; and much later set British M55 and M60 age-group records for that challenging distance. He won two team bronze medals for Spango in the Scottish 6 Stage Road Relay (1985 and 1986). He ran the E to G in 1980 and 1982, when his team finished 9th. Tony was a good club runner taking part in everything that everybody else did while a member of Garscube. He transferred to Clydebank AC and encouraged his son to run with Shettleston Harriers. This had the side benefit of letting Tony train with Bill Scally’s group. He learned a lot and his running improved dramatically. He later joined Dumbarton AAC and competed as a veteran, becoming a prominent member of the Scottish Veteran Harriers Club, winning individual bronze in the 1983 M40 Scottish Masters XC, plus team silver that year, 1984 and 1985. Tony ran for Scotland in the very first Masters Cross-Country International versus England and Wales in 1988 . Gerry was a very good athlete as a youth and junior with Bellahouston running mainly on the track but he was a good road and cross-country runner too, For instance ran the E to G for Bellahouston in 1989 and 1990. Like others of his generation – Bobby Quinn and Alastair Douglas for instance, he opted to run for the University rather than his club when he was a student. The result was that Glasgow University became very powerful indeed and won the Scottish Universities cross-country championships eight times in a row. Tony was part of the Cambuslang team that achieved E to G victory for the first time in 1987. 1978 800 1.52.2; 1978 1500 3.47.7; 1975 5000m 14.37.0. Kenny ran on all surfaces – look at the best times above and the 5000m time for a 17 year old is still pretty good. 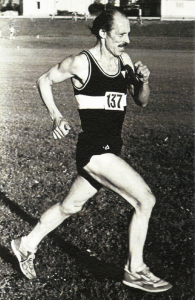 Kenny ran for Scotland in the 1975 World Junior Cross-Country championships. He contributed to silver medals in the 1990 E to G and the 1991 Six Stage Road Relay; and gold in the 1991 Scottish XC Relay. 800m 1.52.8 (1989); 1500m 3.46.8 (1991); One Mile 4.05.6 (1995); 3000m Steeplechase 8.27.93 (1991); 5000m 13.48.86 (1990). Tom started running well in Inverness. With Aberdeen AAC, he won a bronze medal in the 1973 Edinburgh to Glasgow Relay. However, it was his enthusiastic dedication to Birchfield Harriers that contributed to so many top-level successes. He was the club’s long-term President and an enormously popular man. John McCormack was a coal miner who was as tough as a runner as he had to be in his day job. There were many times when he was working in the mine in the morning and racing in the afternoon. In 1956 he finished eighth in the Senior National XC and consequently ran for Scotland in the International XC championships. In the E to G between 1955 (when Springburn finished third) and 1960, he competed six times in succession, usually on the classy second or sixth Stages. 1973 800m 1.53.7; 1974 1500m 3.53.0; 1975 5000m 14.35.5; 1982 Mar 2.34.46. Roy ran the E to G for GU twice and Bellahouston five times.th; and 1993 when they improved to fourth. 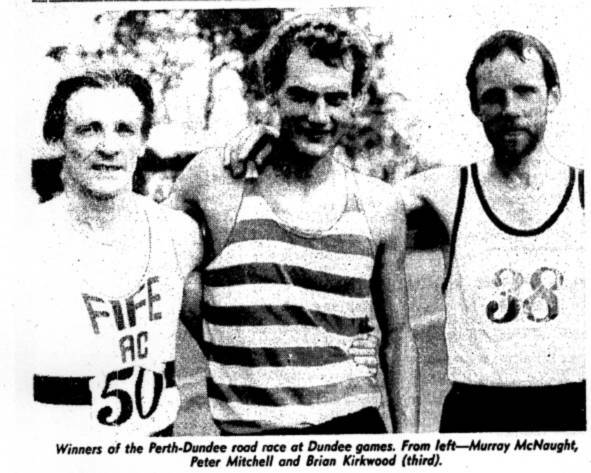 Alan finished second in the 1973 Scottish Indoor 600m championship. Alex McDONALD, Auchmountain Harriers (Greenock). A.K. McDonald was an important figure in Scottish Athletics before and after the Second World War. He was South-Western District Cross-Country Champion in 1935 and his team also won. In 1946 Alex secured a bronze medal in the Scottish Ten Miles Track championship. Alex was a founder member of the Scottish Marathon Club in 1944. He was also an important official and became President of the SCCU in 1960-1961. Douglas was a good runner in all endurance events whether road, track or country – he even took part in the old Glasgow to Fort William Relay (8 runners, 4 stages apiece). He ran in the Edinburgh to Glasgow relay as well as all the winter championships. He was part of the ‘Eight in a Row’ GU H&H team. 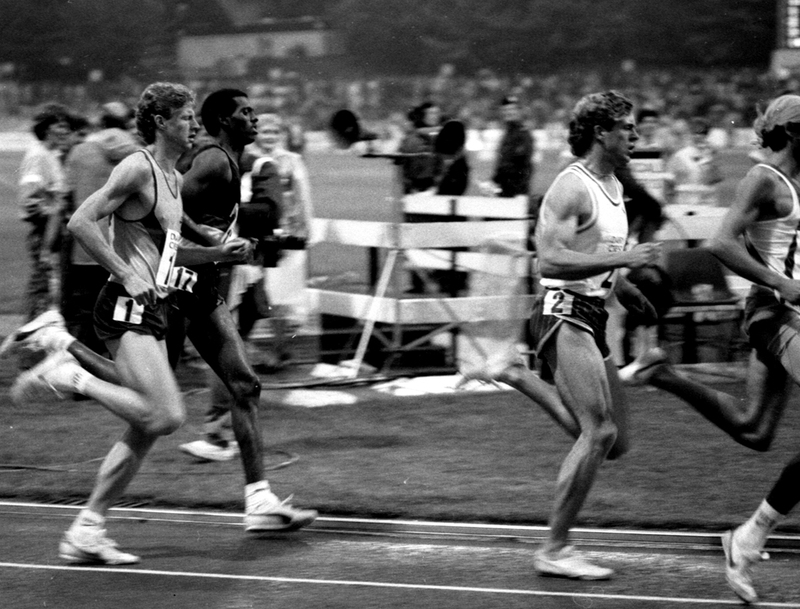 In 1985, he ran well for Scotland in the Edinburgh Waverley Market Marathon, finishing second behind his team-mate Mike Carroll – and Scotland won the team race, defeating Wales, Eire and England. In 1957, Alex finished 9th in the Senior National XC, and consequently ran for Scotland in the International XC Championships, where he was a team counter in 53rd position. However, his favourite surface seemed to be the road. In the E to G (where he was usually given the longest Stage Six), he ran 6 times between 1955 (when Vale was 5th and won the ‘most improved’ awards) and 1961. Their best position was fourth in 1956. In the 1958 Scottish Marathon championship, Alex finished second in 2.32.35. He ran for Scotland in the Cardiff Commonwealth Games Marathon, which held in unbearably hot conditions, and was the only Scot to reach the finish, running 2.29.57.2 for a fine 7th place. Charlie was a good runner with East Kilbride for most of the 1980’s running five E-G relays on stages 2, 4, 6 and 5 before moving to Calderglen, the new club in East Kilbride fo whom he ran in the E-G in 1989. Charlie went on to have an excellent career as a veteran. His best race may have been in 1991 when he was third in the SAAA marathon championship. Hugh McErlean was a very hard man in any race. He never ever gave up and that led to medals in many races, particularly in the Dunbartonshire County Championships on the track and over the country. Among his triumphs was winning the Balloch to Clydebank when it was a 12 mile road race. Hugh is remembered by many as the only man to run two consecutive stages of the Edinburgh to Glasgow relay in the same race. His team mate at the end of the fourth stage did not turn up and nobody stopped Hughie who just kept running and completed the next stage. Pat was a quiet, friendly man who trained extremely hard – often with Colin Youngson. In the E to G, Spango finished 7th in 1981, securing the ‘most improved’ medals; then Pat ran for Aberdeen in the 1984 E to G, when they finished fifth; and 1985 (6th). He also completed several marathons. Duncan was a good all round distance runner who represented Glenpark in everything they did. Danny was a bit of a hero in the Scottish Marathon Club because of his willingness to race, how hard he raced and the times he turned in in every race. A member of Beith at the same time as Ian Harris, they were a formidable duo who did not get too many chances to run in the same team with Ian in the Army and Danny in the Navy. Bert, a popular and respected gentleman, enjoyed a long career in athletics, being successful on track, road and cross-country as a young man and again as a senior veteran runner. In 1963, he was East of Scotland Steeplechase champion. In 1964, for the first time, ESH won the Senior National Cross-Country team title. Bert also helped to win silver and bronze in that event, as he did in the E to G. As a veteran, he won Scottish titles at M65 and M70, as well as securing individual and team silver medals in the British and Irish Masters Cross-Country International. Duncan was a valuable member of VP teams which won several prestigious medals: in the Senior National Cross-Country, silver in 1947 (when he finished 12th), bronze in 1949 and 1950 – and gold in 1951; in the E to G, it was silver in 1949 and gold in 1950. On the track, Walter won a bronze medal in the 1953 Scottish championships 6 Miles; and on the road, another bronze in the 1956 Scottish Marathon. In the Senior National Cross-Country, he added team silver in 1953; and in the E to G, silver in 1953 (when he was fastest on Stage 5) and bronze in 1957. Along with Jim Dingwall and Willie Day, John was a stalwart for FVH from their revival in the 1970s. Perhaps he enjoyed cross-country most, and contributed to 1980s team victories in the East District Cross-Country championships; team silver medals in the 1985 Senior National Cross-Country; and bronze in the 1977 and 1978 Scottish Cross-Country Relay. On the road, it was silver in the 1982 6 Stage Relay; and in the Edinburgh to Glasgow Relay, 1976 bronze and a longed-for, well-earned victory in 1984. Then he became a successful coach of many athletes. For decades John worked as the head brewer and owner at Tryst Brewery, producing excellent real ale – in cask and bottle-conditioned – and not surprisingly winning Scottish champion awards. Dermot specialised in hill-running – he was Scottish champion in 1986 and 1996 – but for Dundee won a silver medal in the 1989 Scottish 6-Stage Road Relay; and team bronze in the 1990 Senior National XC. Alex enjoyed a long career before and after the Second World War. In 1934 he won the Midland ‘Junior’ Cross-Country title; and in the Senior National finished 8th, with his Plebeian Harriers team 1st equal, with Dundee Thistle Harriers. In 1937 they were third team. For Bellahouston in 1947, Alex was an excellent second behind Andy Forbes, and won the team title. Consequently, he represented Scotland in the International XC Championships and counted for the team in 37th place. In 1948, Alex finished 11th in the Senior National and added team silver. In the E to G, Plebeian won in 1933 and Bella won bronze in May 1949. On the track, Alex finished third in the 1947 Scottish 6 Miles championship. In 1979, Duncan finished 16th in the Scottish Junior National Cross-Country and VP won team silver medals. 1968 880y 1:52.8; 1969 800m: 1:54.1; 1969 Mile: 4:00.9; 1969 1500m: 3:53.4; 1968: 2 Miles 8:50.8; 1972 3000m 8:22.8; 1967 3 miles: 13:36.0. 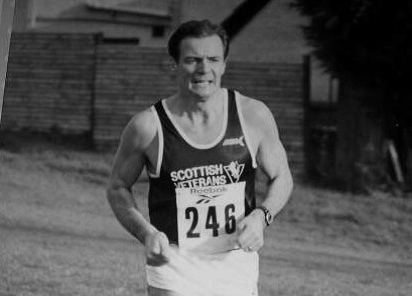 John was an Anglo who came up to Scotland from time to time and ran for Springburn in the the Edinburgh to Glasgow (1968 and ’69) and a few other races such as the Two Miles invitation at Cowal Highland Games. Jim was a good competitive runner who ran in the national cross-country championships and in the Edinburgh to Glasgow for both clubs. He was a strong runner who won a bronze medal in the 1971 Scottish Steeplechase championships. He had represented Scottish Universities at cross-country – and ran well many times (often in deep mud) for Glasgow University. In the E to G he ran five times in succession for GU (1967-1971). Hamish ran well as a young athlete winning races around the country at various Sports meetings and cross-country race including, on the road, the prestigious Clydesdale Harriers Youth Race but disappeared as a senior man. A good runner in the Youths and Junior ranks for Wellpark, maybe particularly on the country with team medals at County and District championships, and the high spot as an individual was in 1957/58 when he was third in the national to John Wright (Clydesdale) and George Govan of Shettleston. ‘Mole’ was a well known figure in Scottish athletics, a bundle of talent that never quite came to fruition. He ran for his club in championships (country, district and national) and in relays (District, Six Stage, Road Relays) and never gave less than 100%. Between 1977 and 1992, Alex ran the E to G 14 times, including 12th place in 1980, which secured the ‘most meritorious’ medals. In 1988 Springburn won gold medals in the Scottish Six Stage Road Relay. Hamish was third in the SAAA 800m championships in 1982 and third in the 1500m the following year. A good all round athlete he represented Scotland several times at 800m and 1500m. Alan ran the E to G for Fife four times between 1976 and 1980: including 1976, when 6th place secured the ‘most improved’ medals; and 1978, when the club was 8th after Alan gained four places when he was second-fastest on Stage Three. Charlie was a consistently good road runner, who ran in the E to G for the North District Select. In 1990 he was fourth (and first Scot) in the Aberdeen Marathon, when he was representing Scotland in a Home Countries International match. In 1981, Colin won a bronze medal in the Scottish Junior National XC (leading EU to team silver medals) and consequently ran for Scotland in the World Cross, in which he was a team counter. In the Senior National, with ESH, he won the 1982 team title. In the E to G, after running twice for EU, he featured in two victorious ESH teams (1981 and 1982). All this from an Orienteer, who represented GB in many World championship events between 1981 and 1989. Colin ran cross-country for the hard-training, hard-celebrating Strath team, represented Scottish Universities and, in the 1967 E to G, contributed to 12th place, which secured the ‘most improved’ medals. 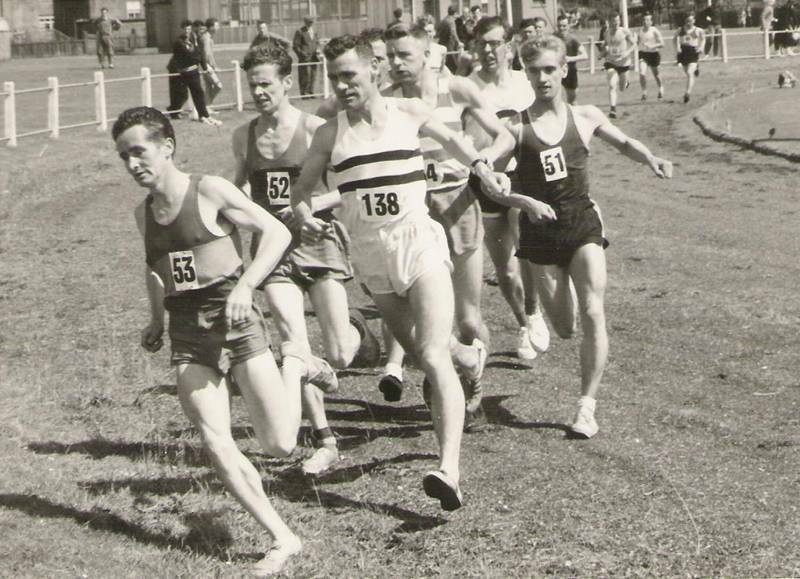 Alex McKAY (Vale of Leven AAC) was a good track runner who also raced cross country for his club, turning out in several Edinburghto Glasgow races in the 1960’s. Andrew was a Scottish International Steeplechaser. EAC won silver medals in the 1979 Scottish National Youths Cross-Country. He ran the E to G twice, including 1981, when he was third on Stage One and the team finished 6th. Andrew won a bronze medal in the 1982 Scottish Six Stage Relay. Frank McKay started out with Clydesdale aherriers before swtching to VPAAC. In 1953 he contributed to VP winning the E to G; and added a silver medal in 1955, before returning to Clydesdale Harriers. Hugh McKAY, Dundee University, Central Region, Dundee Hawkhill, Fife. Between 1982 and 1986, Hugh ran the E to G four times for DHH, including 1985, when they finished 6th. In 1991 he won the Dundee Marathon in a sprint finish from Rod Bell of DHH. On the track Andy won the SAAA 10 miles in 1972 but he is much better known for his exploits on the road and over the country. Andy McKean was a really outstanding runner on the Scottish cross-country scene when he won four cross-country championships in five years, at times seeming invincible. He won in 1973, ’75, ’76 and ’77 and represented Scotland in the ICCU World Cross-Country Championships in 1971 and ’72 and then in the IAAF World Cross-Country Championships in 1973, ’74, ’75, ’76, ’77 an ’78: a total of eight consecutive international appearances. Tom is probably Scotland’s best ever track athlete, he certainly has a better record in major Games and Championships than any other. You really need to read the full profile via the link above. Ian was a cheerful, tireless competitor travelling all over Scotland to races, often in the company of clubmate Jim Sloss . Ian was a very successful, well-organised, encouraging ESH team manager who was considered invaluable by his runners in so many Scottish championship victories, especially in the Edinburgh to Glasgow Road Relay. McKim was a very good all round endurance runner. Although he ran well on the country and always picked up places on his stage of the Edinburgh to Glasgow, the tall long-striding McKim was in his element as a steeplechaser and it was a loss to Scottish track when he left to live in England. Robert was a Scottish International steeplechaser who won a bronze medal in the 1979 Scottish Championship. For East Kilbride, he ran well in the E to G three times in succession – the club’s best position was 6th in 1977. In 1947, he finished a fine 7th in the Senior National XC championships and his team won the title. Dave was a good club runner with East Kilbride who ran and raced in every championship for which he was eligible. A real enthusiast, he persuaded Tom O’Reilly (Springburn) to try running on the hills, and is ‘credited’ with getting Tom into the ‘Island Peaks Challenge’ as his running partner. Gavin was a good runner who ran the E to G three times between 1981 and 1983. He had a good career as a veteran, finishing second in the SVHC Marathon at Bellahouston behind Dave Kerr (Garscube Harriers) in 1981. 1965 880y 1.51.8; 1963 1M 4.07.9; 1964 2M 8.59.2; 1961 3M 14.23.0; 1962 3000S 9.21.7. Alex McLean was a quiet, gentle man who was a ferocious competitor. If we look at his competitive record at national level we see that quite clearly. He started his career with Greenock Glenpark Harriers for whom he was eleventh finisher in the 1939 national championship. It was a time when athletes often switched clubs for competition reasons and these moves were accepted by the clubs concerned. It was no surprise to see him turn out for Bellahouston Harriers after the war and it was in their colours that he won the SAAA track championships over 10 Miles in 1947 and 1948, and the Six Miles in 1948 and 1949. Over the country he was placed 16th in 1947 winning a team gold medal, fourth in 1948 when the team was second and he himself was selected for the ICCU International Championships. His last race for the Glasgow club was in 1949 when he was 30th and again he won a team silver. 1950 saw him back at Greenock for whom he ran in four more national championships, the best being in 1953 when he was ninth. On the roads in the Edinburgh to Glasgow relay, he ran the sixth stage for the Greenock Glenpark team that won the most meritorious medal in 1939. After the War, in 1950 he again ran the sixth stage for the Greenock club moving up to third place and helping them to bronze, he ran sixth in 1951 for the fourth placed team,the same stage again in 1952 saw him pull in three places but the club could only finish 15th and sixth again in 1953 in an unplaced squad. Five races, all on the sixth stage. Alex was a good runner, well liked and respected by all in Scottish athletics he was another who could have been much better but for the years between 1939 and 1945 being excised from his record. He ran the E to G five times between 1949 and 1954, winning team bronze in 1951 and 1954, when he moved up three places on Stage Two. He ran the E to G three times (1954-56) and Bellahouston finished third in 1956. After finishing 5th in the 1948 Senior National XC, he ran for Scotland in the International Championships. In the E to G, Glenpark won team bronze medals in 1950. Albert was a cyclist before he was a runner and although of a bigger build than the usual distance runner, he turned in many useful times on the track. He won a bronze medal in the 1972 Scottish Indoor 600m championships. Albert also ran road and cross-country. Shettleston won the 1946 unofficial Scottish Cross-Country Championship, with four runners in the top ten. Consequently, Charles represented Scotland in the International Cross-Country Championships in Ayr. In 1947 he won a silver medal in the Scottish 3 Miles track championships. Andy, who was born in 1951, has enjoyed a very long, successful career as a Veteran/Master athlete: winning medals in six different 5-year age-groups at Scottish, British and European levels; and running frequently for Scotland in the British and Irish 5 Nations Cross-Country Masters International. In the Junior National Cross-Country, between 1967 and 1969, Shettleston won team silver and then two gold medals, with Martin 4th in both victories. He ran for Scotland in the 1968 International Junior Cross-Country championships, finishing in a very good 17th position. In the E to G, which Martin ran three times between 1966 and 1968, he contributed to silver in 1967 and gold in 1968. Peter ran the E to G in 1982, 1983 and 84 (when his team finished 7th and won the ‘most meritorious’ awards. Arthur ran the E to G in 1975 (when Strathclyde finished 8th) and 1976. Despite being an outstanding International track athlete, Davie always supported his club in road and cross-country events. In 1973 he was fifth in the Scottish Junior XC championships (VP team silver) and ran for Scotland in the World Junior XC championships (finishing a very good 17th). Then he starred in the VP team that won the Midland XC Relay title. In the E to G, which Davie ran an amazing 17 times in succession, between 1970 and 1986, VP won two silver medals and one bronze. 1986 800 1.50.2; 1989 1500 3.43.42; 1989 1M 4.05.3; 1991 3000 8.24.6. Donald was the 1979 North District XC Junior Champion. He won a silver medal in the 1986 Scottish 1500m and bronze in 1989. He finished third in the 800m championships twice (1983 and 1985). He was a Scottish International track athlete; and also featured in the Edinburgh AC team which finished 4th in the 1989 E to G. For Edinburgh University, he ran that prestigious relay four times. In 1981, he won the Scottish Youths XC Championships and consequently ran for Scotland in the World Junior Cross-Country Championships. For Ayrshire, he ran the E to G in 1981 and 1982. James ran the E to G for Bellahouston in 1970 (when they finished 7th) and 1971. In addition, he represented Glasgow Police in that prestigious relay four times. Much later, he ran well as a veteran athlete. Bernie ran the E to G as a veteran in 1987. In 1988, he ran for Scotland in the very first British and Irish Masters Cross-Country International. He contributed to team silver and bronze medals in that prestigious annual event. Bernie won M45 silver in the 1991 Scottish Masters Cross-Country. Shettleston had won the team title in 1985. Murray ran the E to G: for Strathclyde University in 1967, when they were 12th and secured the ‘most improved’ medals; and competed for Fife seven times between 1980 and 1987 – usually having the responsibility of Stage 8. Their best position of 6th in 1982. He improved inexorably as a marathon runner: winning the 1985 Dundee Marathon; and running for Scottish international marathon teams in both 1985 and 1986. Having won the 1983 Scottish Junior National Cross-Country championships, John ran for Scotland in the World Junior Cross-Country. He featured in the Law & District team that finished 8th in the 1982 E to G; and also took part in 1983. Willie showed early promise as a track athlete but later on preferred longer road races, winning a bronze medal in the 1988 Scottish Marathon championship. In 1949, he finished fourth in the Scottish Senior National XC and then was a counter for the Scottish team in the International XC championships. He ran the E to G five times between 1949 and 1953, always on the longest Stage Six. Irvine’s best position was 6th in 1952.